Julian Assange, the WikiLeaks founder, was arrested by British police at the Ecuadorian embassy in London on Thursday morning after having his asylum dramatically revoked. The London Metropolitan Police entered Ecuador’s diplomatic base in West London on Thursday morning and took Assange into custody. 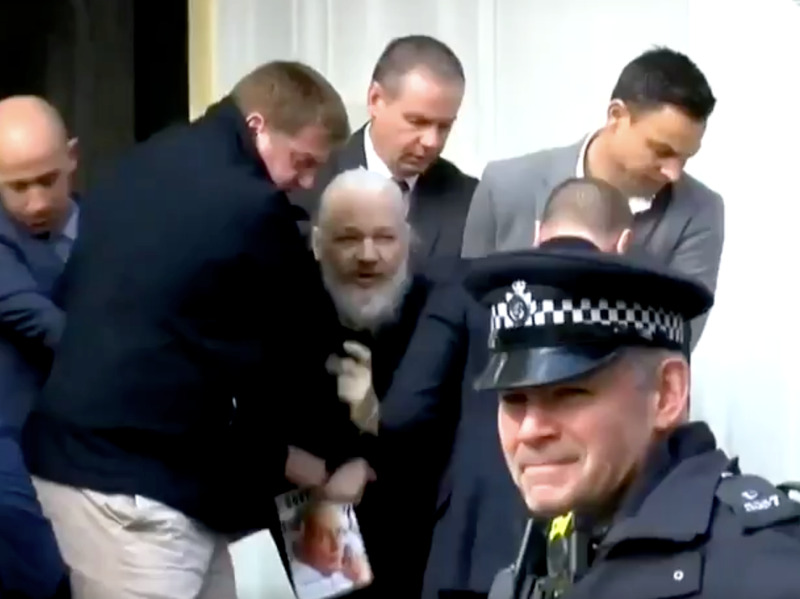 Video footage showed a heavily-bearded Assange being forcibly removed from the embassy and placed into a police van. He is due to appear in court soon. Business Insider has contacted Assange’s lawyer and representatives for comment. President Lenín Moreno said in the video: “The patience of Ecuador has reached its limit on the behavior of Mr Assange.” He said that Assange installed electronic equipment prohibited in the embassy, mistreated security guards, and accessed the embassy’s security files during his stay, which lasted six years and nine months. There has been a warrant issued for Assange’s arrest since June 29, 2012, after he failed to appear in court to face charges of sexual misconduct in Sweden, which he denies. Though Swedish prosecutors dropped the investigation against him in 2017, he also faced arrest for breaching former bail conditions in the UK. But Assange, an Australian national, had been able to avoid arrest because Ecuador granted him asylum in June 2012. He has been living in its embassy in west London since then. Assange giving a press conference at the Ecuadorian embassy in May 2017. WikiLeaks said last week that a “high level source within the Ecuadorian state” had said that Assange would be expelled within “hours to days,” and that it had already agreed to let the UK arrest Assange. He could now face an extradition request from the US over WikiLeaks’ involvement in releasing sensitive military documents from US Army whistleblower Chelsea Manning in 2010 and leaking Russian-hacked Democratic National Committee (DNC) emails during the 2016 presidential election. Special Counsel Robert Mueller, who recently completed his investigation into the Trump 2016 presidential campaign’s ties to Russia, also investigated Assange over the leaked DNC emails. Last year, prosecutors in Virginia also inadvertently revealed in a court filing for a separate case that they had charged him with an unspecified offense. Though the charges are not clear, it strongly suggests that the US government is likely to extradite him. Assange is currently in custody at a central London police station and will be taken to Westminster Magistrates’ Court “as soon as is possible,” the Metropolitan Police said in a statement. Former “Baywatch” star Pamela Anderson, who is a high-profile supporter and confidante of Assange, tweeted that she was “in shock” and slammed Ecuador and Britain for facilitating the arrest.